The ‘rosy scenario’ of so-called recovery in US manufacturing is a hyped media myth, and is more fiction than reality. A new study says it offers a dangerous sense of complacency to business and the public, as America faces a $458 billion trade deficit. “A lot of people are desperate for positive economic news, so articles suggesting that there’s a revival of manufacturing get a lot of traction,” Adams Nager and Robert Atkinson, from the Information Technology & Innovation Foundation, said in Monday’s report.The Washington DC-based think tank is non-partisan and not for profit, according to the group’s website. The authors claim that many reports “torture the data” by masking the decline in manufacturing output between 2007 and 2013 in order to claim a miraculous ‘recovery’. Though employment and output are both growing, they are not at a fast enough rate to declare a US manufacturing renaissance, the report says. “Much of the growth since the recession’s lows was just a cyclical recovery instead of real structural growth that will improve long-term conditions, and there is a strong possibility that manufacturing will once again decline once domestic demand recovers,” it says. American manufacturing has lost over a million jobs net and over 15,000 manufacturers since the beginning the recession, which took hold in 2008. Based on these numbers, the US only added one new manufacturing job for every five that were lost. “It’s true that we’ve had four straight years of growth, and that we’ve added 520,000 jobs in manufacturing in the last three years,” says Nager. But that compares to 2.5 million jobs lost between 2007 and 2009. These figures can be accounted for due to the big turnaround in the automobile industry. “We have stretched six cool examples [of the rebirth of manufacturing] into a whole news trend,” the authors of the report wrote. By the end of 2013, real manufacturing value added was still 3.2 percent below 2007 levels, even though GDP grew 5.6 percent. 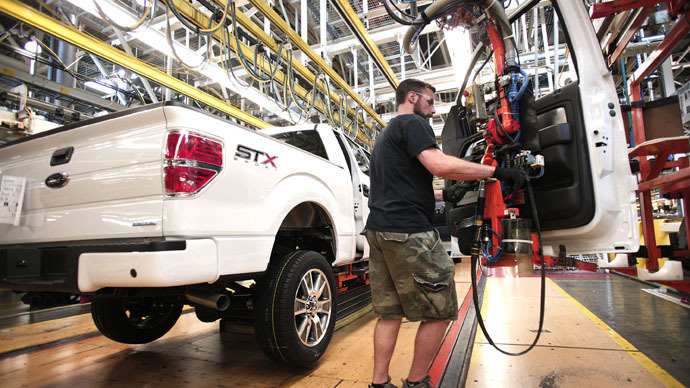 The study argues that the best measure of the health of US manufacturing is real value added. “In short, it is unwise to assume that US manufacturing will continue to rebound without significant changes in national policy,” the authors conclude in warning.